Did they raise a new queen? Is she laying? 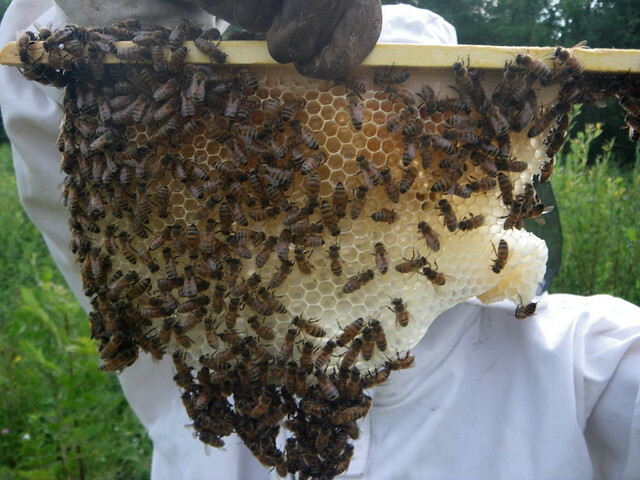 A month is a long time in the beekeeping season to wait and hope that a colony has everything lined up to successfully re-queen themselves. 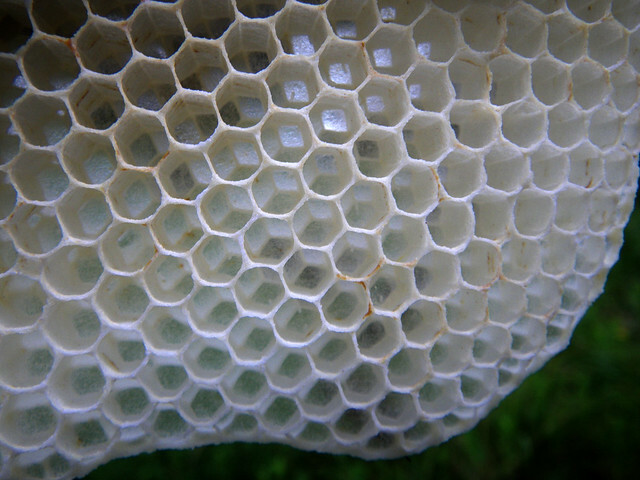 Today was thirty-three days since we split the premiere hive. 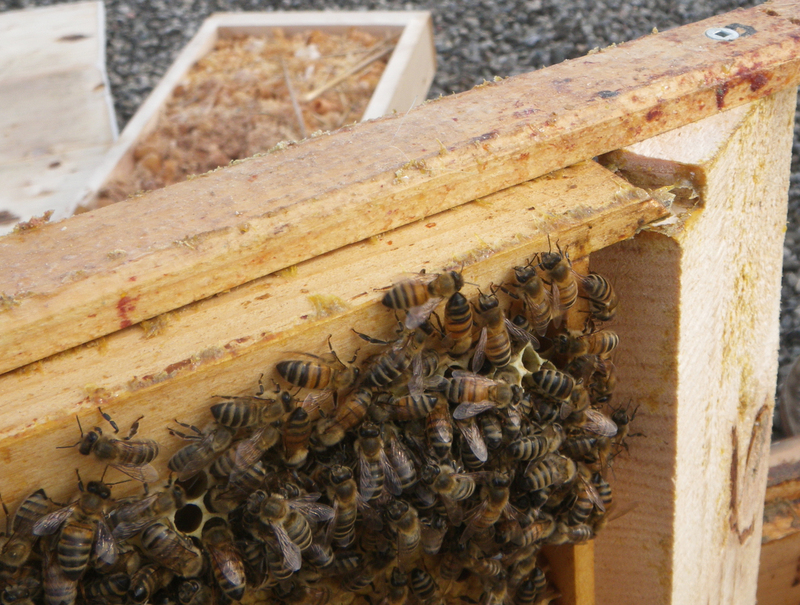 The point at which we really expect to have a newly mated queen. 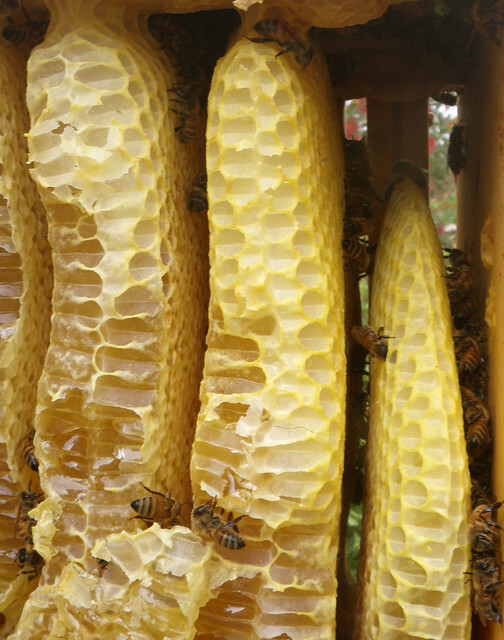 We are pleased to report the many bees in this hive built a whole lot of comb since last week. I believe every single bar had some comb on it. 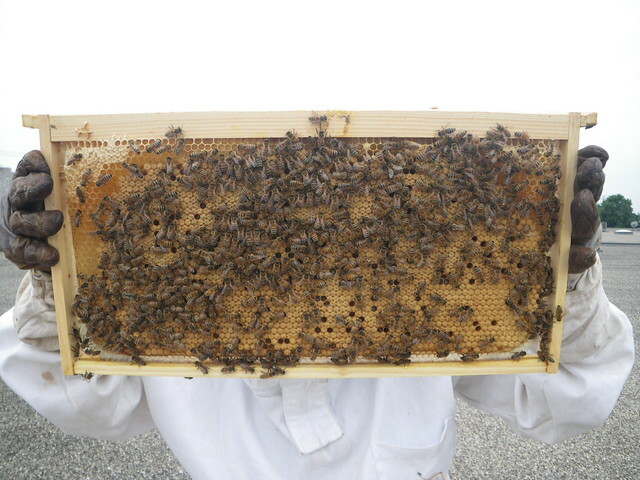 A few of the combs were a substantial size. 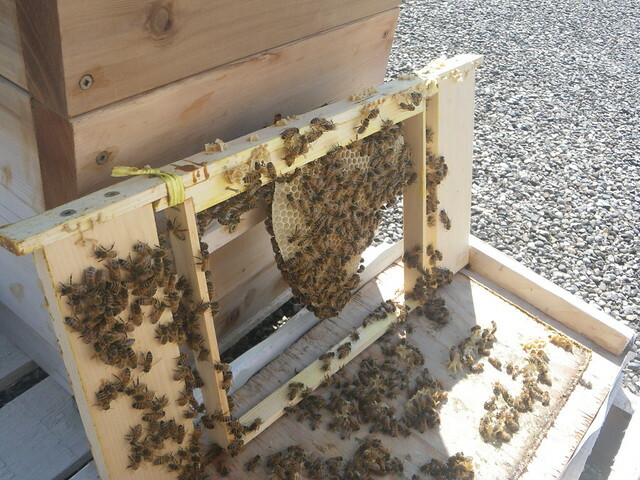 They still had a few bits of comb crossing the bars that we had to spend some time twisting straight, but not too bad. 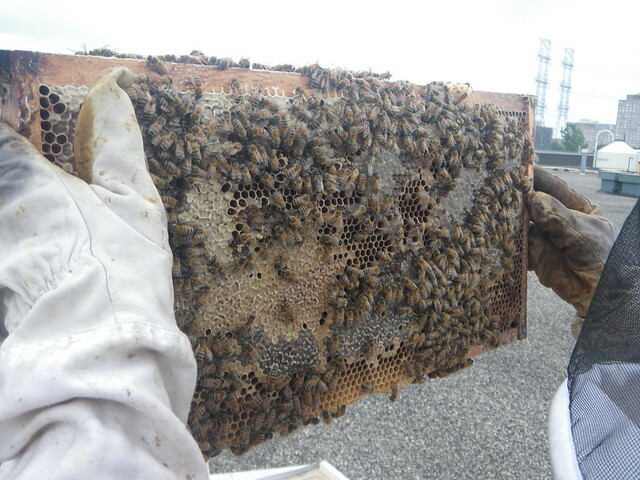 Most of the comb was concentrated toward the entrance of the hive. 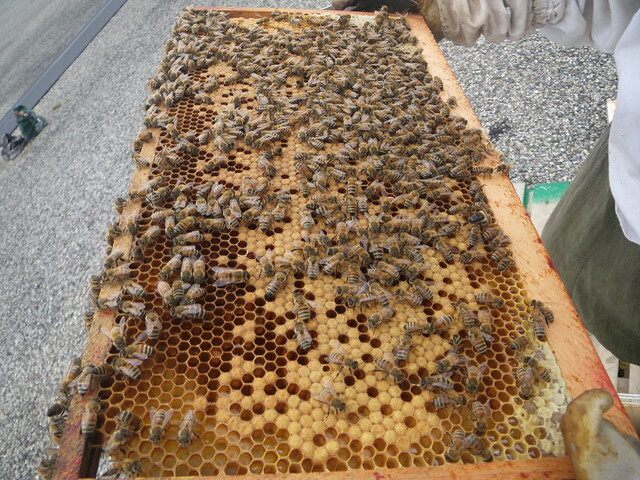 We flipped some of the combs around, so the gaps remaining for the bees to fill in with comb alternated between the front and back of the hive, thus eliminating some of the potential space in which the bees could make comb across bars. 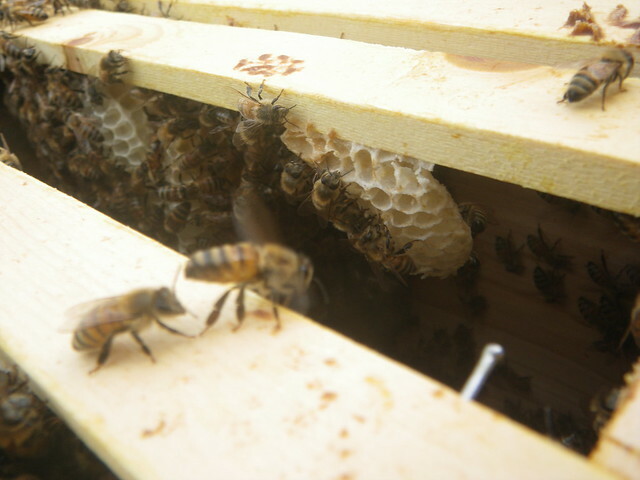 Most excitng of all is that we did see a good number of eggs on the new comb! It was hard to photograph, but we saw a good laying pattern with one egg per cell. 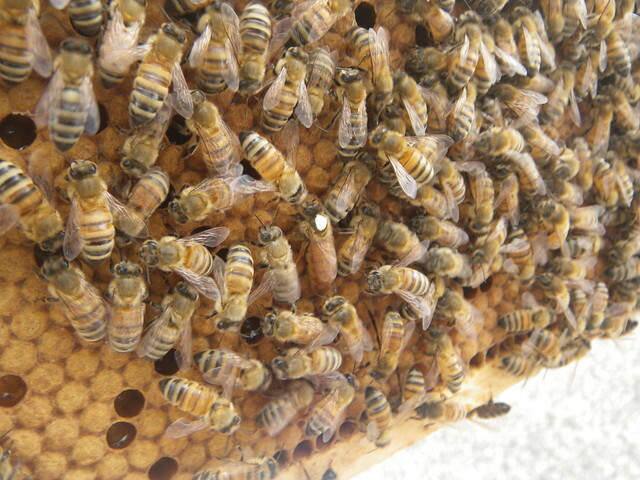 So even though we didn't see her, we feel fairly confident we have a new queen and not a laying worker! 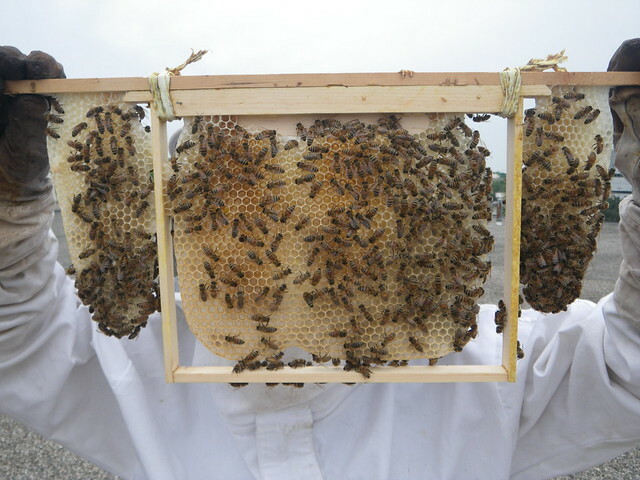 We look forward to giving the new queen's hive a new name for the next inspection. Most of my concerns for this colony are relieved. 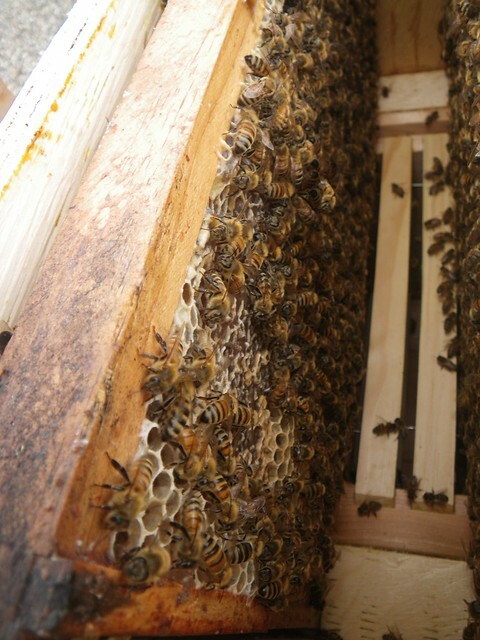 I just hope they have enough free comb to not feel crowded. 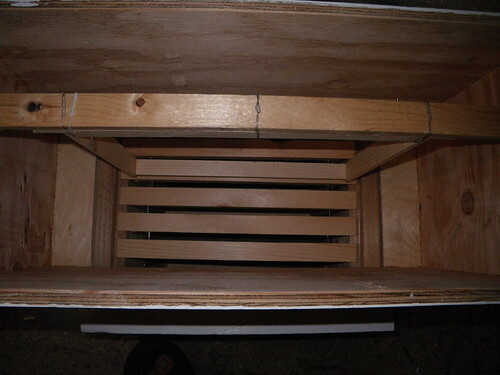 I did add, and seed a new box between the bottom box and the honey. 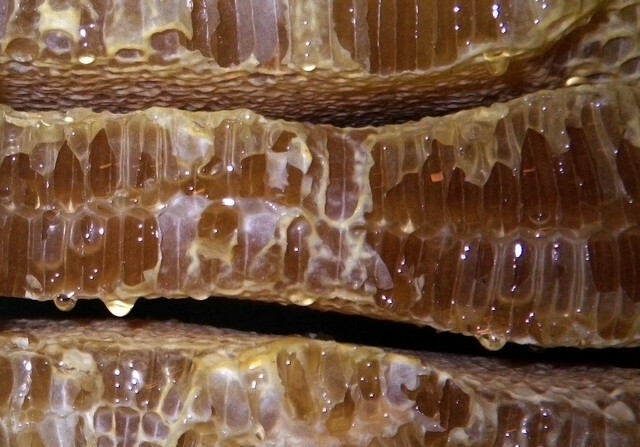 The seed comb is the 'substantial comb' pictured above. 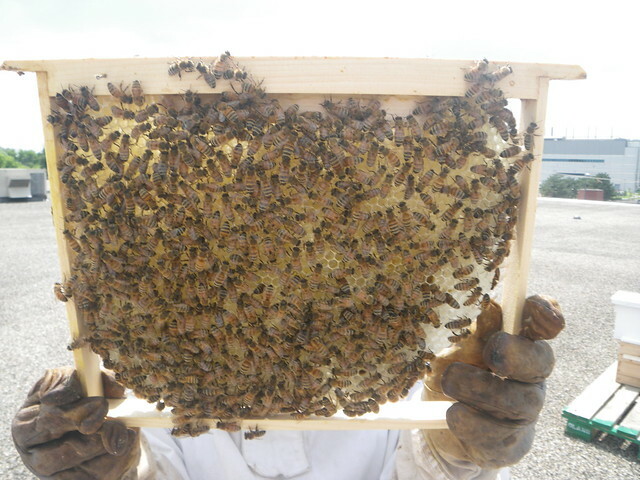 In the hive where we kept the old queen, they went from working on two frames to four in the bottom box. 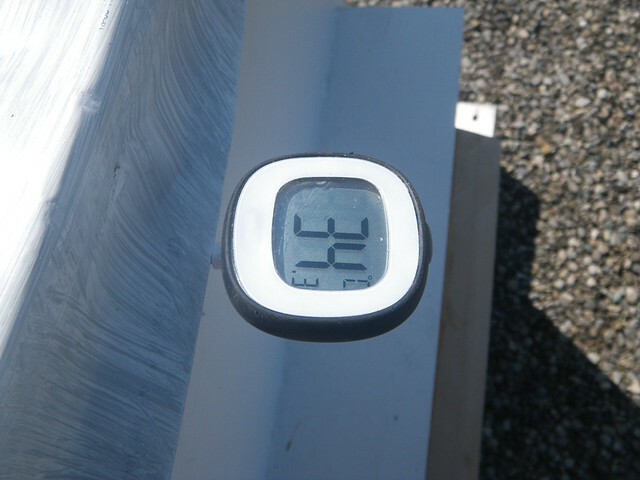 Mostly straight, but we made some minor adjustments. 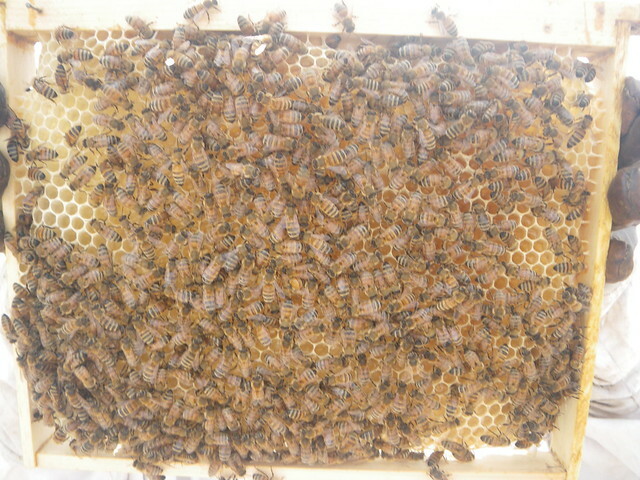 We visited the bees today fully expecting to make a split. 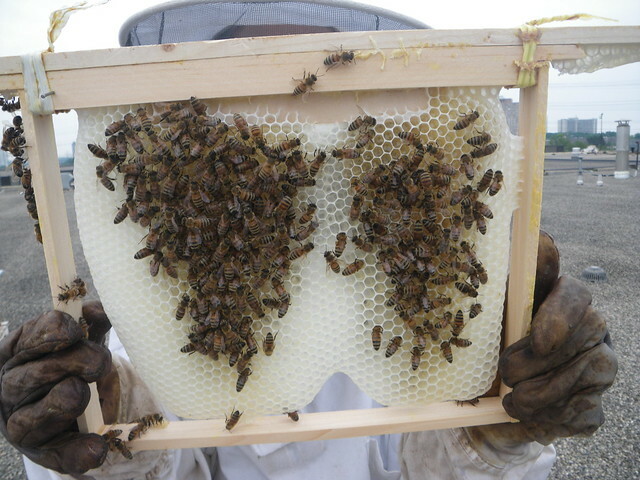 We hope to see what we can do as beekeepers without any chemical controls for mites, so we see a split as an opportunity to break the brood cycle and therefore mite reproduction. The inspiration for doing this comes from the rotation system. 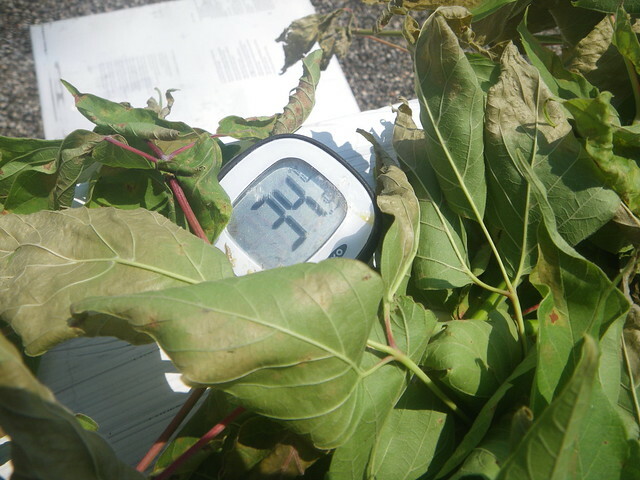 There have been a few hot days, but the weather has been holding steady at around 20 celcius. 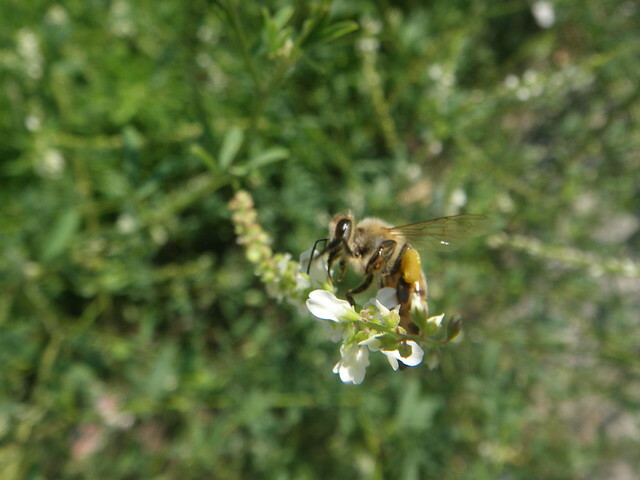 Clover and black locust have been in bloom but I'm uncertain how much of either is in the area. 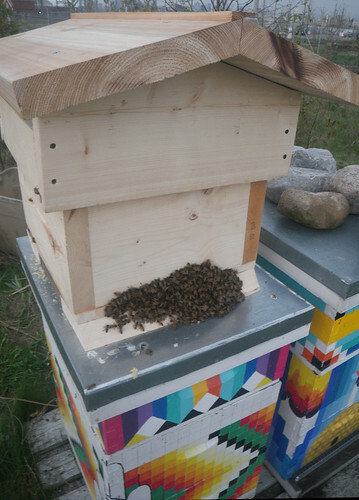 The entrance had a lot of activity and the bees remained very calm as we opened the hive. The box we moved to the top, now the 4th box, had a fair bit going on now. 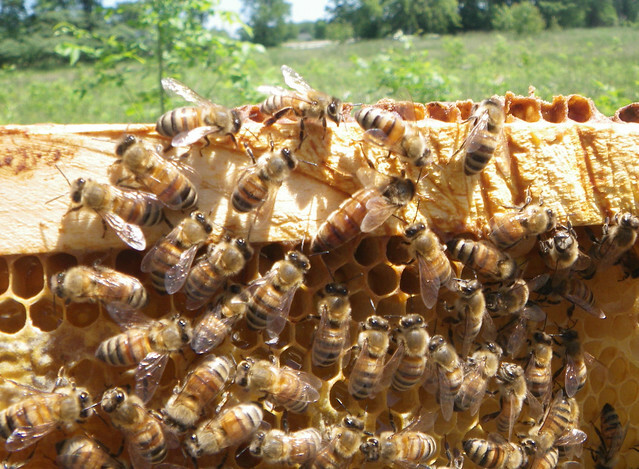 Lots of young fuzzy bees, some little patches of brood and decent amounts of pollen and nectar. 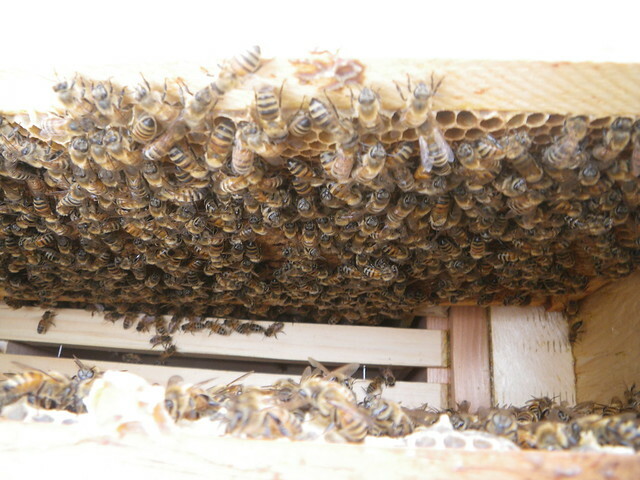 We also spotted the queen (The first time in this hive since last summer). She was looking big and beautiful. This was mighty convenient as we needed to know where she was for this split. 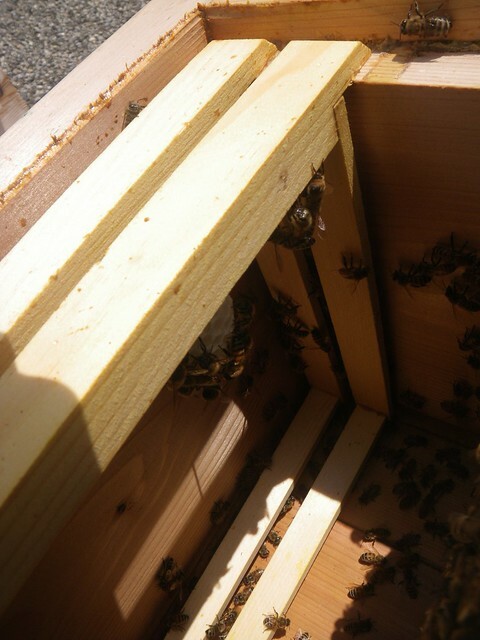 So we set this box aside, and proceeded to check if any new queens had been started in the queen cups we spotted last time. 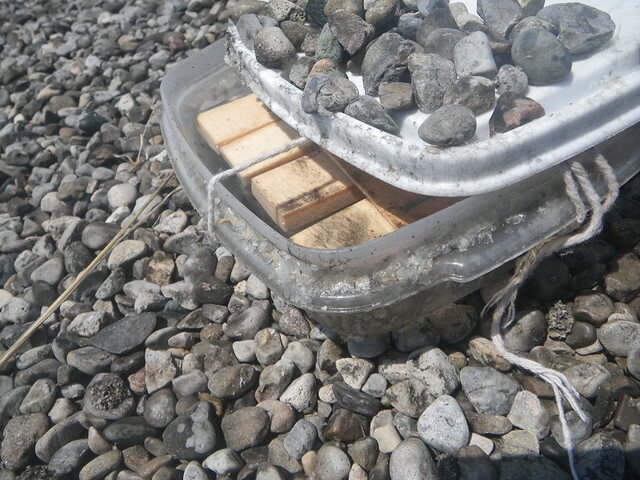 The 3rd box appeared to have one of a handful of cups with an egg (albeit somewhat off center in the cell). 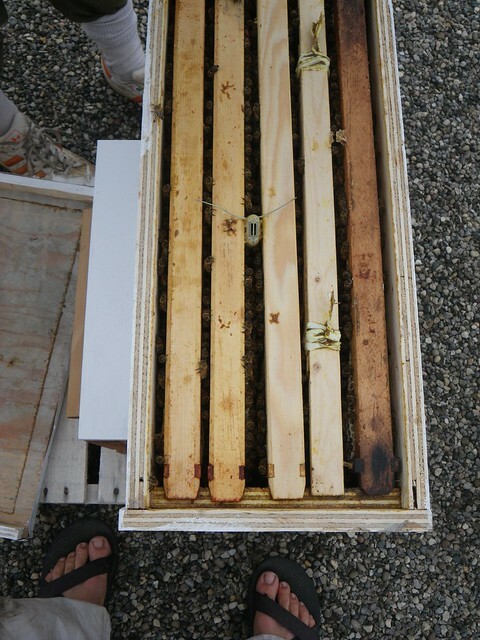 We believe we saw two queen eggs in the 2nd box, but for some reason had trouble locating them again after a more complete check of the combs. 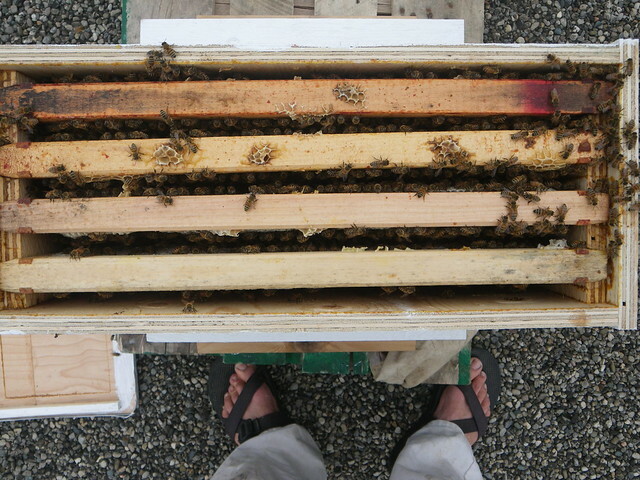 Good amount of stores and brood in these boxes too. 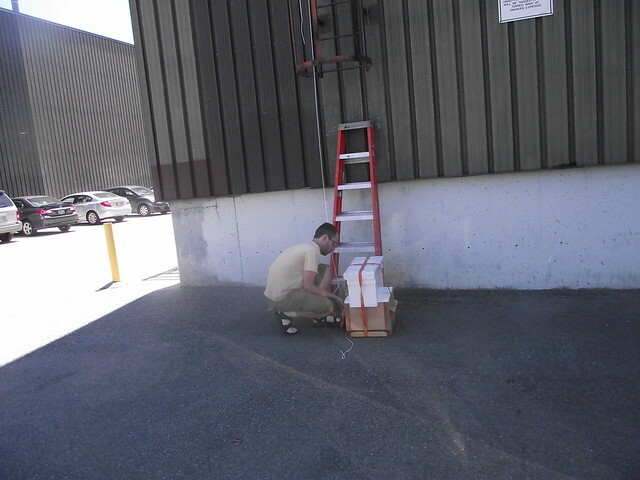 The bottom box remained untouched. 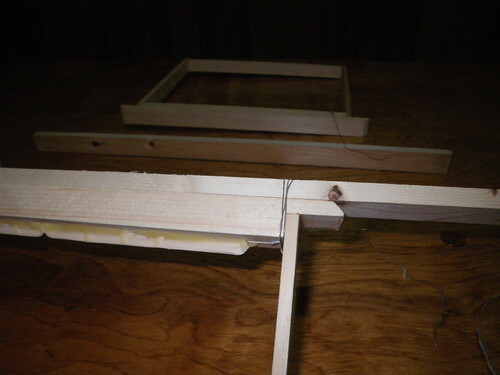 We felt confident that we could go ahead with the split but that is when things got a little messy. 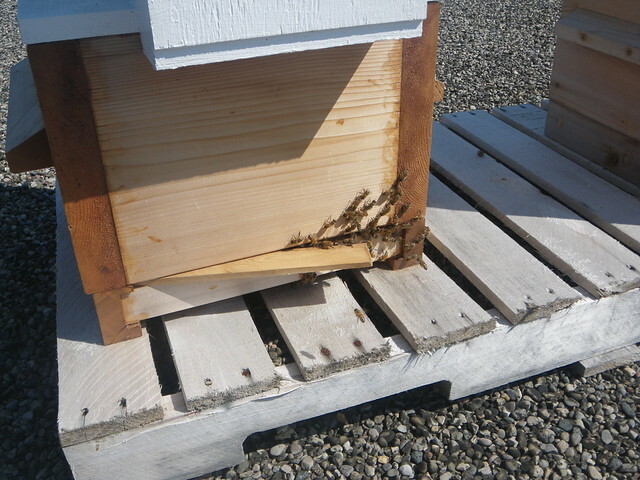 We had the 2nd box placed on its side from trying to double check the queen eggs, and one comb in the box that had been built with a large gap down the center broke in half. 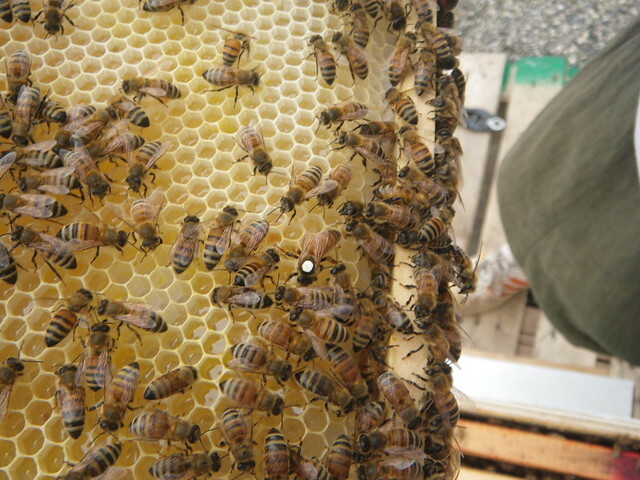 The half that broke off had two queen cups, but we couldn't verify if they were ones with eggs. 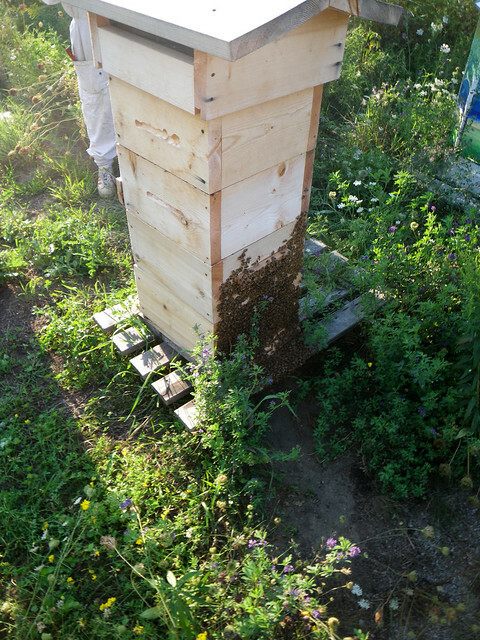 So we moved the box with the old queen and the empty bottom box seval meters away to form a new colony. 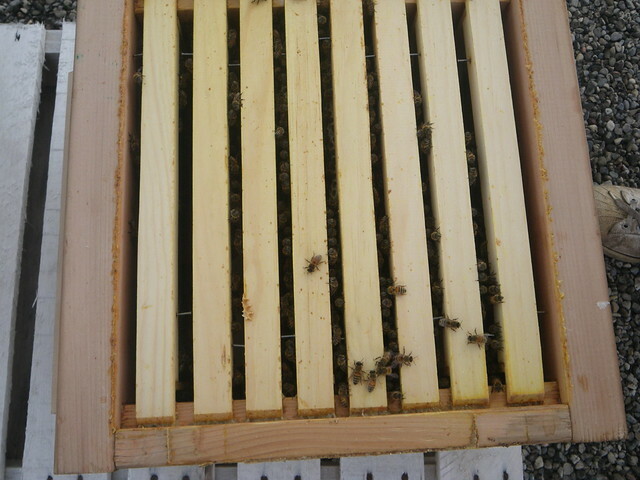 We placed the broken comb of honey and pollen resting on the side of the empty bottom box and added an entrance reducer. 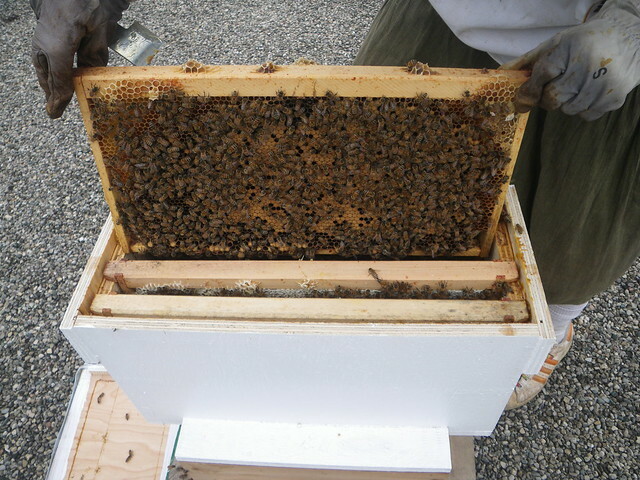 We gave the old colony a new empty box and will have to wait and see if they are able to make a new queen. 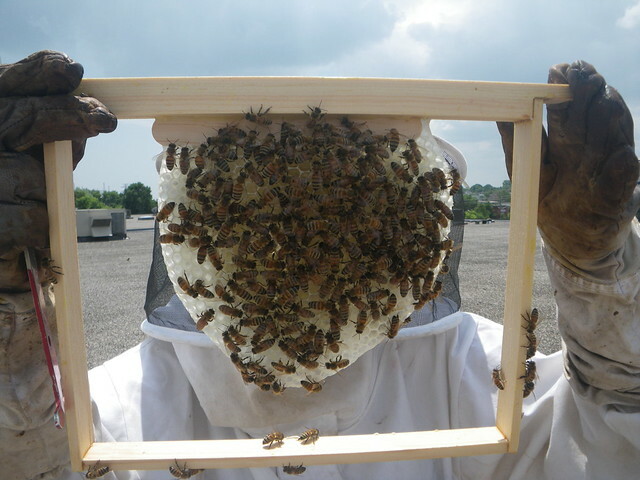 I collected this swarm from a toronto backyard last spring and sheltered them in a warré hive. Seeing this lead me to believe there might be something to the theory that a frame-less hive allows for better temperature/air flow control. For the most part they built straight comb. 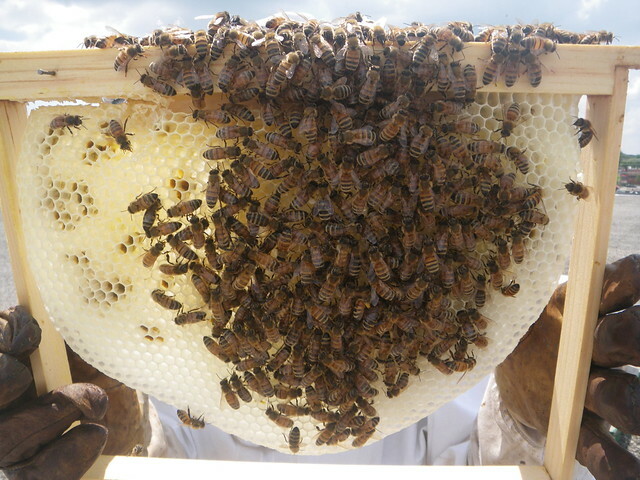 I think it's possible to do comb by comb inspection without frames if you are careful about how you set the hive up, but it certainly requires more time and gentleness as you move the combs about and separate the boxes. It's really nice on the back to have smaller lighter boxes. I now have my sights set on even less lifting. 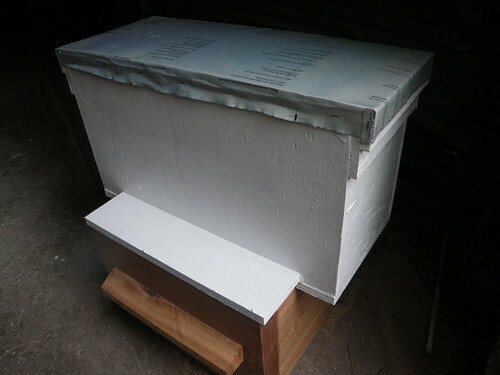 I discovered the possibility of home made hive lifts which take advantage of the warré's protruding box handles. 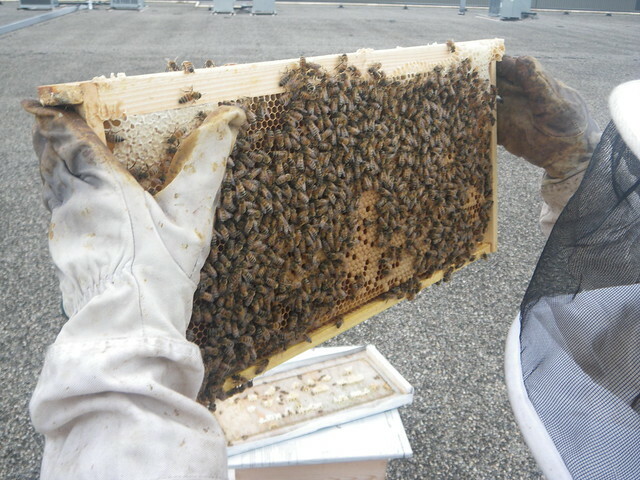 The colony had a real productive season. It built up fast and strong. 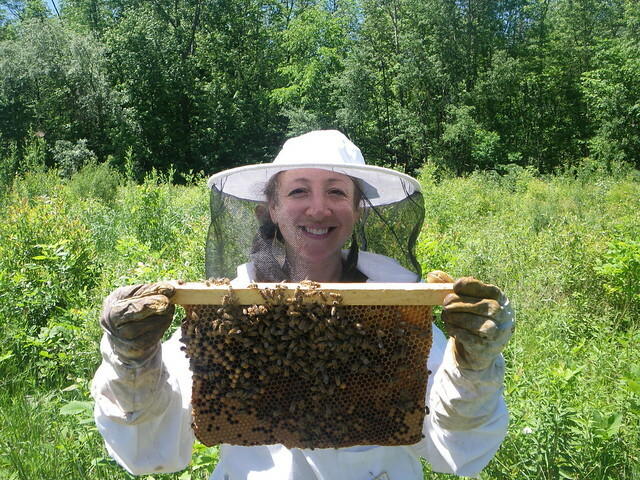 I only had access to visit the hives about once per month, and they often surprised me by overflowing out of the space I had left them. 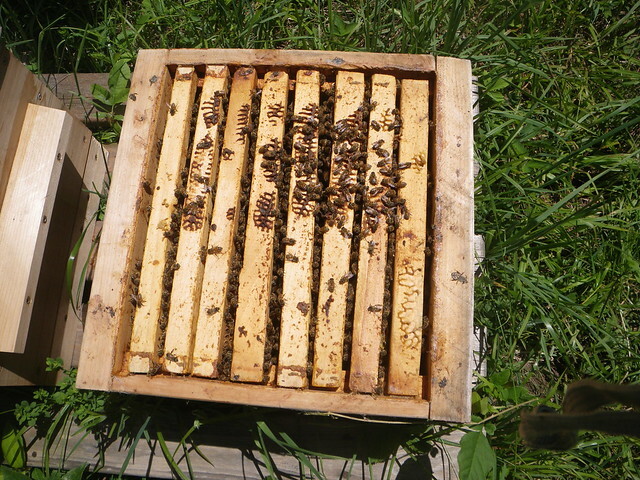 They filled five boxes and I was able to harvest two boxes. 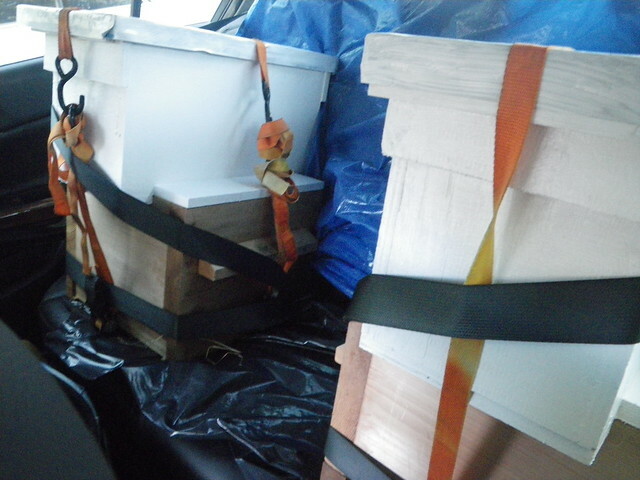 They went into winter with three very heavy boxes. 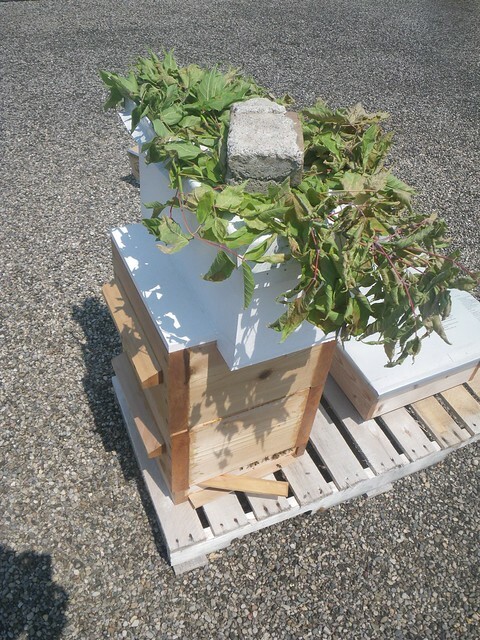 The hive was placed in a good location with fields of wild flowers directly in front of the hive, however, it was a long dry summer and many other hives did not do so well. 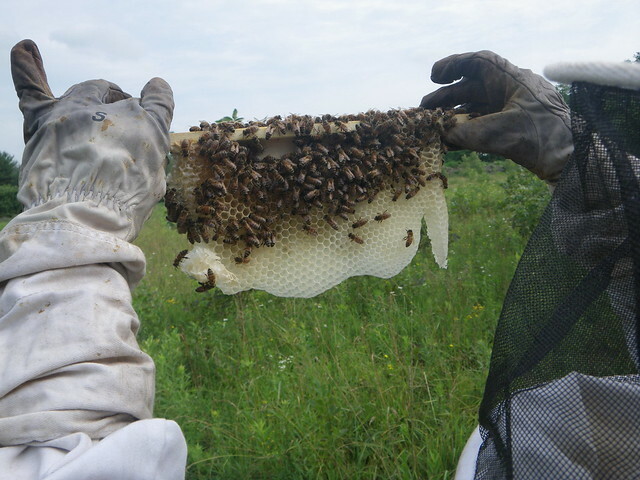 It's possible part of this colonies success might have been due to the failure of other hives in the area that they were able to rob out. 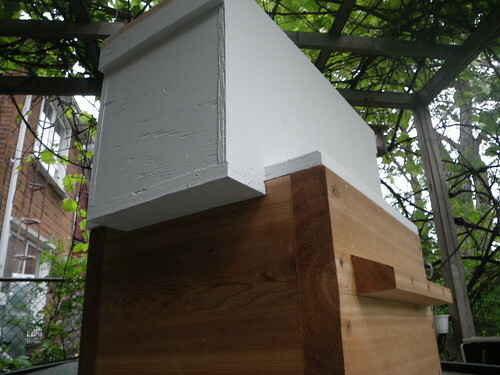 So far I'm a fan of the warré hive, I appreciate the smaller dimensions and the roof/quilt design. I think there are great benefits to a frame-less hive, but have decided to build warré frames for next year (for more confident swarm control and so I can perform drastic manipulations with greater ease, like breaking the brood cycle to control mites ).